It’s time for another block in the Save the Bees block of the Month Quilt Along! 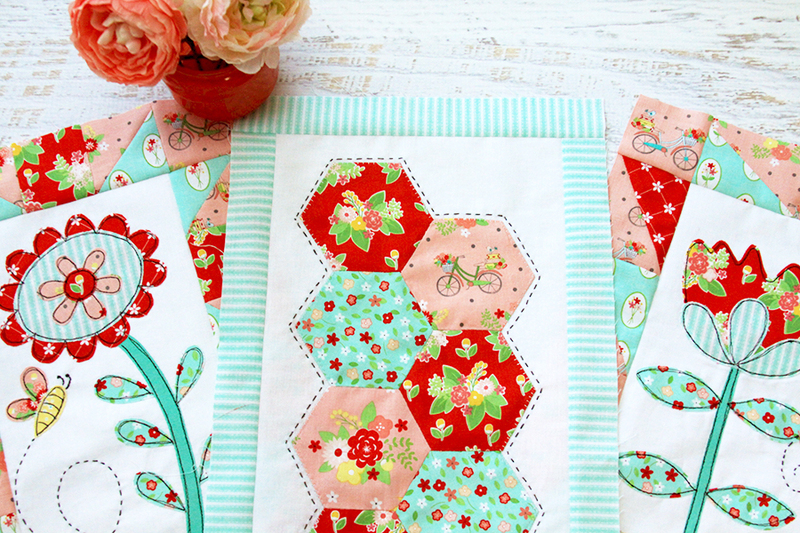 Every month a group of us are sewing along with Jacquelynne Steves and her super cute Save the Bees Quilt. 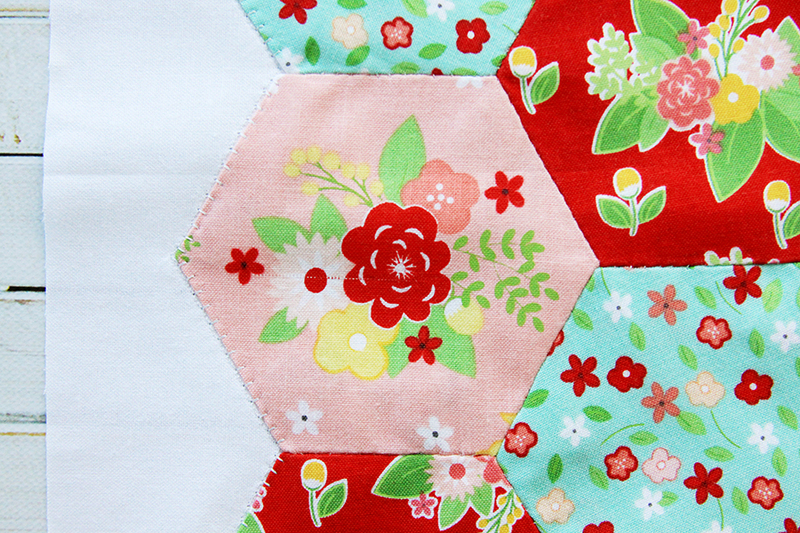 This month we’re sewing up little hexies – they are perfect to go along with the flowers and bee blocks. I am really loving how this is coming together! I’m using Vintage Adventure fabrics for my quilt and I think the florals are looking so fun with these blocks. 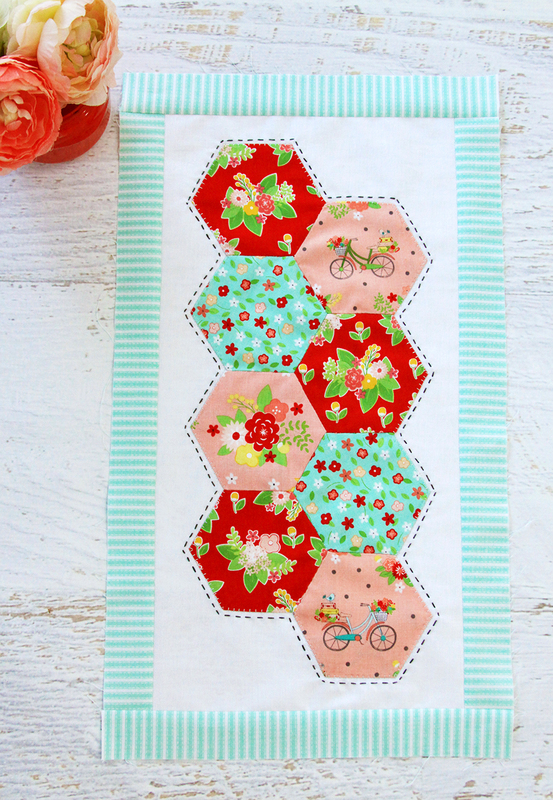 I did a little fussy cutting for my hexagons – focusing on the bicycles and some little florals. For my version I did regular paper piecing for the hexagons then stitched them to the background fabric with a small blanket stitch on my machine. Then I added a little embroidery running stitch around the hexagons to tie in the block with the bee blocks. I think it helps them stand out too! Click below for the instructions at Jacquelynne Steves website! 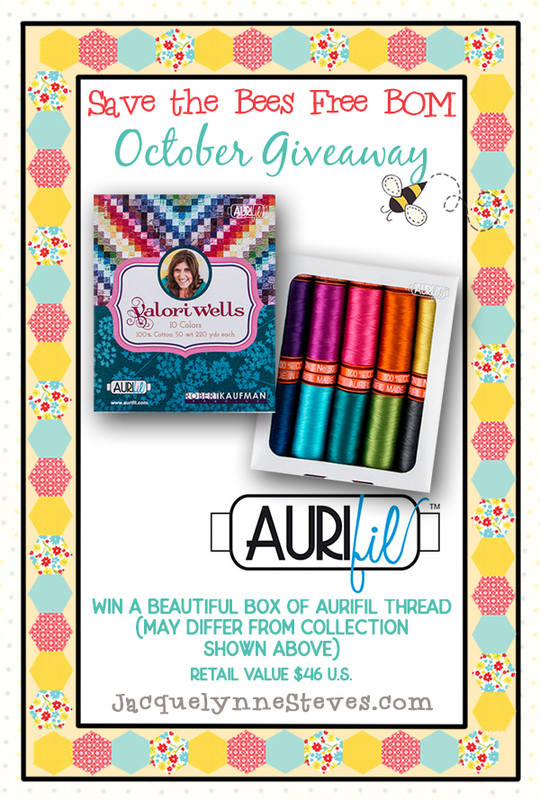 This month our giveaway is an amazing box of everyone’s favorite thread – Aurifil! The winner will receive a box of Aurifil 50 wt thread – it may differ from the one shown. Giveaway is open to US and International winners and you can enter at each website of those of us sewing along! – Giveaway is closed. I am working on two Christmas tree skirts – one for each of my daughters. I need to finish them soon! I love the black outline stitching on your hexagon piece. I quit making holiday lists a long time ago – never got ’em finished. Instead, I make things throughout the year and just give them to whom they were made fore. I an working on some ornaments for my daughter’s tree. Lots of mug rugs for friends and family! I’m working on items for my daughter to sell at a local craft show. Not many in my family to sew for but there’s and new member on the way for next year. I’m planning on making a Halloween throw for my sister and I promised my nephew a quilt. No new decorations. I am planning to make a backpack for my brother who visits his son’s family often. I might do something for my nieces. Happy Creating. Holiday sewing had better be done by now as I get overtime work between now and February. I did finish an overized twin quilt for one of my grandsons so that is done. I found a quilt pattern last year for a loving Christmas Quilt/Throw. I got the material earlier in the year and I have finished it in plenty of time for the holidays. I just love the cardinals and poinsettias. Of course I have holiday sewing aspirations, but before I even think about it I have to finish my king size quilt. Almost done the quilting then the binding and done! First, I love the embrodiery touch on your block. I do not have any holiday sewing planned…yet. I don’t think I will but sometimes, something grabs you! I have a bunch of holiday sewing planned, in my head! I should have started it this past weekend, but relaxing won out!! Thanks for sharing all your beeee youtiful blocks with us! I have 3 or 4 quilts I hope to have done for Christmas gifts this year. I have some crazy quilt Christmas blocks to put together–would like to practice some machine quilting with them. I’m working on some halloween costumes and decorations right now. I’m also looking for some Christmas decorations to sew. I have a few Christmas gifts completed and working on more. I just finished all the blocks for a Christmas quilt and hope to finish it by Christmas. I want to make a tote bag as a gift for a friend (but if I don’t get to it, there’s always her birthday). I have a trunk full of Christmas material and patterns that will serve as gifts this year. HI,yes I always have way more plans than I complete! Placemats, decorated lids for quart candy jars, table runners, new tree ornaments (like to do 24), see how that goes! Thanks for your blog+giveaway! I have lots of ideas and intentions in my head, but with my schedule, I doubt they will get made. My Christmas projects are just a few – all organized into separate plastic organizers from the Dollar Store – a table runner made from inherited double wedding ring quilt piece leftovers from family quilters who have since passed on, a jellyroll star quilt, and my big brother’s University of Montana logo quilt for his new guest room. Aurifil thread would compliment all these projects! oh my, do I have some sewing planned mostly for the Fall Season! Pumpkins!!!! And there is one quilt with a forest of trees for a Christmas Quilt in the works! Table runners and coordinating napkins are quick projects for holiday sewing. I have a couple of quilts to finish, ornaments for the grandkids and a tree skirt. I love the colors you are using for the quilt. Holiday sewing has begun. I am doing redworking santa’s and snowmen for christmas pillows. also starting an autumn table runner. I am working on some jelly roll rugs. They are lots of fun to make. I have a new Great Grandbaby due around Christmas, so am busy making her a quilt. Along with Pillow cases for my other 6 Great grandbabies, for Christmas. Holiday sewing? I plan to make some bags and pouches and pillow cases at least. Last year I started a few projects that involved sewing some rows of mini charms, and then sticking sweet Christmas phrases. Well, I never got around to choosing my Christmas phrases and doing the stitching. That is my goal for this year: do the stitching. Finish the projects. Give the gifts. Finish a tree skirt I started last year. Kitchen theme this year for my daughters. Embroidered towels. quilted placemats and an apron form their Dad’s old jeans. I am workkng on a pillow with a pumpkin on it. I ,ove the colours you chose for your Bee blocks. No I do not have any holiday stitching planned…lots of other projects in the works! I’m working on a Christmas stocking that will complete my family set. I am working on 3 Christmas table runners. Hoping to have them done with other projects by Thanksgiving so they can be gifted early! Yes I usually make something for all the grown children & grandhildren for the day, this time it will be infinity scarves for winter. I plan to make a red and white table runner for Christmas. I have already made a new Fall/pumpkin table runner that will look wonderful. Christmas is still only a far off thought. I’m currently planning some Halloween sewing but not specific Christmas sewing yet but that can change quickly. I’m teaching a beginning sewing class at our church and tomorrow we will be starting Christmas tree skirts. Can’t wait to see how they turn out. Last month they made Christmas tree folded napkins. I have plenty of ideas for holiday sewing, but realistically I know I will sew what I can when I can. If my ideas don’t work out for this year, I will keep sewing and have things ready for next year. I don’t do well with deadlines. I am working on two twin bed quilts for Christmas presents. I am making a few lap quilts, couch quilts, and wall hangers for gifts. I have 3 made and about 7 more to go. Too many projects in the works to make anything new for Christmas. I did purchase an apron kit last year that I should finish. I bought a pair of slippers for Myself….and now my daughter and grandson insist I Sew Them a Pair just like them! They are adorable, warm and very comfy and No Longer available anywhere in retail….soooo Slippers sewn by me, under the Tree it is! No holiday sewing planned, but lots of pre-holiday sewing on the go! I love the running stitch round your hexies, it makes them really pop! Working on a couple table runners for Christmas gifts. Love the extra hand stitching around the hexies! The only Christmas sewing I want to do this year is make a pillow or two for my home. Last year, I had quite a list and got myself so worked up…not going down that lane this year! 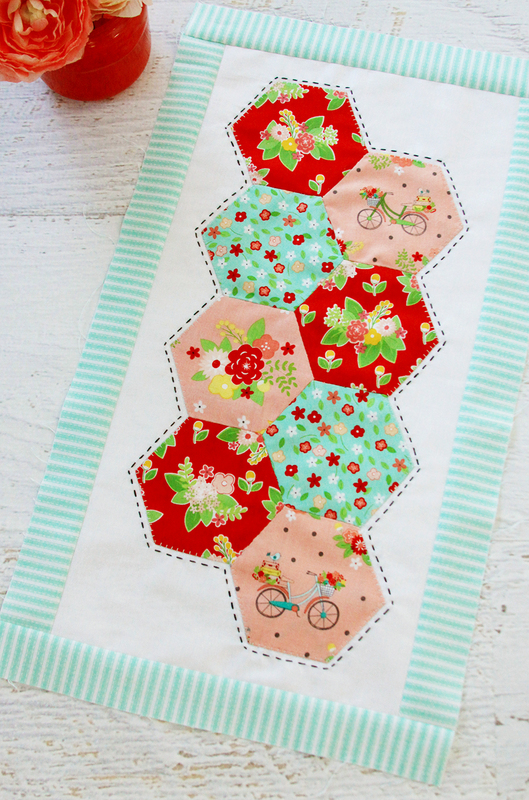 I love the stitching around the hexies… it does make the block pop up and fit in with the other two! I plan to sew Bonnie Hunter’s new mystery over the holidays… it’s my tradition and I never miss one! I started my holiday sewing in June. I am on track at the moment. I enjoy that feeling. I have 3 throw-size Christmas quilts planned. Since it’s already October 1, I’d better get busy! I have made my Needle Nannies, quilts and potholders. Now I want some new ornament patterns. Your blocks are so pretty and I like the stitching you did around the hexagons it really does make that block blend in with the others. The only thing I have planned for holiday sewing is finishing a Christmas quilt that I started over a year ago. I am finishing up a Christmas themed king size quilt for my granddaughter and have a king size quilt ready to go to the long arm quilter for my daughter. I plan on making pillow shams for both quilts. If given the time, ha ha, I will make a tree skirt for our tree. I am starting my Christmas sewing, making stockings for all the new grand babies and a fire place rug. I have a ton of holiday sewing planned, but I doubt I’ll get it all done. Table toppers, table runners, mug rugs, stockings. Love the fabrics in your block! Yes, I am working on a few holiday projects – trying to finish a quilt for my granddaughter, make some pillows for her and my twin grandsons, finished a table runner and would like to make some placemats if time allows! I am planning to sew a quilt for my daughter for a Christmas gift. It is all cut out and waiting to be put together. Thanks! Love this quilt. My husband wants to be a beekeeper. So far, I made my daughter 2 Halloween pillows and myself a Fall theme lap quilt. I have a Christmas quilt from Vintage Holiday all cut out, ready to put together. I am planning on some mug rugs for friends and family. I have some patterns ready to go. They might end up being New Year gifts. Better late than never, I always say! I will be working on something small for daughters and friends. Haven’t decided what yet. Oops, better get going! I have several that I want to do but will I get to them? I have decided that stressing about it just isn’t fun, so if I get to it great, if not it will wait for me. I just like to enjoy the process. No holiday sewing planned beyond trying to get all my works in progress finished! I have Christmas panels for three great-grand babies. I’m adding little borders and half-square triangles and more borders. Everything is cut, ironed, starched and ready for sewing. I’m on my way to a retreat!!!!! I am wanting to make a table topper for a cousin in Christmas fabrics. But since I have a new grandbaby arriving in November, that is a lofty goal. I’m making a spaceship quilt for my grandson. I have lots of ideas in my head for gifts but in reality they probably won’t get done. Holiday sewing is my favorite thing to do. I am planning my projects now and will begin soon. right now i don’t know what i am going to do for Christmas sewing. i’m sure i will think of something. I love these blocks! Wish I was caught up enough to start another project. I’m a newbie at this craft and can find myself getting overwhelmed by unfinished projects at times. I have no Christmas sewing plans yet, but I’m looking for ideas for my hand made cards that I make every year. Thanks for inspiring us all! I have several planned Christmas projects – towels turned to aprons, an appliqued wall hanging of the nativity and a combination of embroidery and fabric nativity wall hanging. I like your early 1900s color theme! I have a few table runners completed. Now I’m working on a Christmas quilt called Midnight Clear. It’s almost finished! I have a quilt I need to finish for a gift, but other than that, I don’t have any plans. I learned long ago, if you plan for something with a deadline, everything in the world will get in your way! I have Christmas gifts to make for co workers still. Making all of them mu rugs. Pretty choice of fabrics. I like how you centered the bicycles. I make pillowcases for the grandkids for Christmas. I bought the fabric for 4 of them–need 3 more. I make most of my gifts. I am planning to make throw pillows and table runners This year. I always have holiday sewing planned. Whether I get to it or not is anyone’s guess this year, with so much going on. Sadly, it might only end up being potholders. I am currently working on items for a Christmas bazaar-my first in many years! This year will mostly be handmade gifts for friends and family. I don’t have any plans for sewing gifts this year. I may make some bowl-holders for both daughters. My big project right now is a Christmas quilt for my husband and me!!!!! We have no quilts around the house….I give them all away. I finally decided that we need our own Christmas quilt that I have made. I sure hope I finish it before Thanksgiving!!!! I bought lots of fabric on clearance last January but haven’t yet decided what I’m going to do with it…a cozy quilt of some kind…I might finally give foundation paper piecing a try! I am planning to quilt a Christmas wall hanging for the holidays. I have also purchased matching fabric for a table runner and placemats. I’m working on some quilts and Christmas gifts, I also joined a ornament swap! I will be working on two outfits for my husband and myself to go to a medieval themed Christmas party. I promised him that I would get them made. Oh what did I get myself into? Working on a snowman quilt made with fleece. I started awall hanging for my neice three years ago. I gave it to her for Christmas unfinished then took it back to finish. I must finish it this Christmas. I’ve got one gift finished and working on another. May finally start on Advent Calendar or paper piecing nativity projects. I just got a quilt back from my LAQ that is a Christmas present for my oldest granddaughters. Now it’s time to bind and her gift will be complete! I plan to make some sewing blocks into wall hangings and make some throw pillows and a lap quilt. I just love Aurafil threads. Making quilts for my daughter and son. I’m working on a Christmas Present Quilt and I am so excited to finish! I have two Christmas quilts I worked on and finally finished the tops,now to get them quilted. But I really want to start a fall quilt now, isn’t Fall a holiday? My fabrics are so beautiful, I need to create a quilt with them. I have lots of plans for Christmas sewing-mostly gifts. The question is–will I get it done?! I like the stitching around the hexis on your block! I am hoping to make my new granddaughter her own Christmas stocking, as well as, some ‘soft’ ornaments. My sister has been hinting for a new tree skirt. I hope to get it made. I need to finish up a few ufo’s for family gifts. Attempting an advent calendar this year with my mom and daughter. There will be lots of hot chocolate, cookies and I’m more than sure our seam ripper will be in great use. I do not have any holiday sewing planned now but you can’t never tell. So many ideas swirling in my head ,as usual. The list is always long. The Results,not so much.The only thing definite,table runners. See where my imagination takes me from there. Working on some Christmas ideas but have already gifted one big Christmas runner! I am making Nordic pattern table runners to match the Christmas quilts I’ve made for my family. I’d like to make ornaments of some sort for all my co-workers in my building — that would be 40+. I’d like something fast and easy, but still meaningful. I’m still looking, but the search is fun. I love your color selection for your blocks! I plan on finishing a couple of table runners that I squirreled away last year. It’s time to finish some projects, not start more! We will see how I do with that plan. I have a quilt to finish and several other projects to finish up. I try to do most of my Christmas gifts. I bake a lot also. I have started now so hears hoping I finish up by the 24th…lol. I sure could use this thread. Thanks for the giveaway! I”m working on a Little Bo Peep fall festival costume, Autumn themed quilt, Christmas quilt (one I started on Save The Bees I jumped in with both feet making quilts). I have a small project to finish up and then I will clear my table and start sewing Christmas gifts…hanging kitchen towels this year. I get the package of BAR TOWELS from Costco and attach decorative fabric hangers to the top. I secure the top tabs with velcro dots as I don’t enjoy doing buttonholes. I always sew gifts for Christmas but this year I am running behind and I”m not sure how much I will be able to get done. I do love giving quilts and other sewn items as gifts. So many projects that they will never all get done. But I have finished a felt cardinal ornament that I designed. I try to do something every year and give as gifts. Planning on some fabric ornaments with the kids name on it and year. Love the Save The Bees blocks. I’m working on a throw for our family Christmas “Chinese Gift Exchange.” Would love to win this giveaway. I am trying to get finished several large EPP dresden plate candle mats. They will have one holiday on one side and Christmas on the other. So far its been Halloween and Christmas, doing double duty saves on storage room. I’m going to try my hand at paper piecing this weekend. Christmas placemats or mug rugs are in my future – I hope! I am working on a Christmas quilt. And I’m collecting fabric to make my son a quilt for Christmas! Working on finishing a Bucilla Needlecraft Pinoccio 24″ Doll I started over 40 years ago. Now, have the time to complete for my son. While making 6 quilts for grandchildren and other little ones. I have decided to make Christmas throws to give to charity in all of my children’s names. I know that will really enjoy it more, since I have made each of them at least two apiece. So this is my win (sew), win (sew) Christmas! Oh Yeah! I like to complete the save the bees quilt for a Christmas present! I’m still looking for that one cool new small sewing item I could make for everyone this year! I also have a Christmas tree quilt as a UFO I would love to finish! Let me know for any new Christmas ideas that are small but nice to gift! Thank you all!!! Holiday sewing? You bet! Two quilts that aredy to be quilted and bound. I am making Halloween trick or treat bags for my grandkids and stockings for Christmas! I am planning to make pillowcases for some of the younger grands and Christmas stockings for my sisters. The stockings will be made from an old quilt of my mothers. It was very worn and I thought this would be a good way to repurpose it. First I have the Christmas tree skirt for my daughter that I didn’t finish last year! Then there are table runners to make for my girlfriends from my Christmas fabric stash, 2 Advent calendar kits, embroidery stocking kits and, ha ha, a Christmas quilt kit for me. I am going to a UFO retreat in 2 weeks, and will be sewing like crazy for 5 days to get tops done, then off to quilter. I’m not really a holiday sewer but I am enjoy some fall colors in my quilting. I recently did a Boden block in orange and black to hang in my front window. I have some pumpkins on the agenda soon too! I am making Mommy & Me and dolly makes 3 aprons for my granddaughter and my great granddaughter and for my grandson and great grandson they will get matching aprons for next grilling season. My goal is a handmade ornament for each of the twelve grandkids with gift certificate pocket! Making ornaments for family n friends !!!!! Yes, I have holiday sewing planned. I’m making my grandson a quilt. I’m half way done! Also I’m making cute embellished kitchen towels for my 4 girls! I just started those today. Definately, I have so many projects planned– some for gifts and some for decorating ! Sew fun! I am working on mini wall hangings for my family. I have two sisters, six nieces and three great nieces and their all getting one. I have them cut out, appliquéd and quilted, just need to add the binding. Most definitely. I bought an embroidery design of a Christmas Tree wall hanging which I’m looking forward to getting made before Christmas. I am making holiday and seasonal table runners and bread basket liners as gifts. I plan on making some place mats as Christmas gifts. I plan lots of things to make, but I never get it all done I’m kind of slow. I really like your bee blocks. I am working on an Advent Calander I actually started last year LOL Also i am working on a quilted tree wall hanging. I plan on making mug rugs for some of my co-workers, and I’m trying to finish a baby quilt (I-Spy) to give as a Christmas present. I’m making some stuffed snowmen for a friend, but beyond that I haven’t really thought about it. 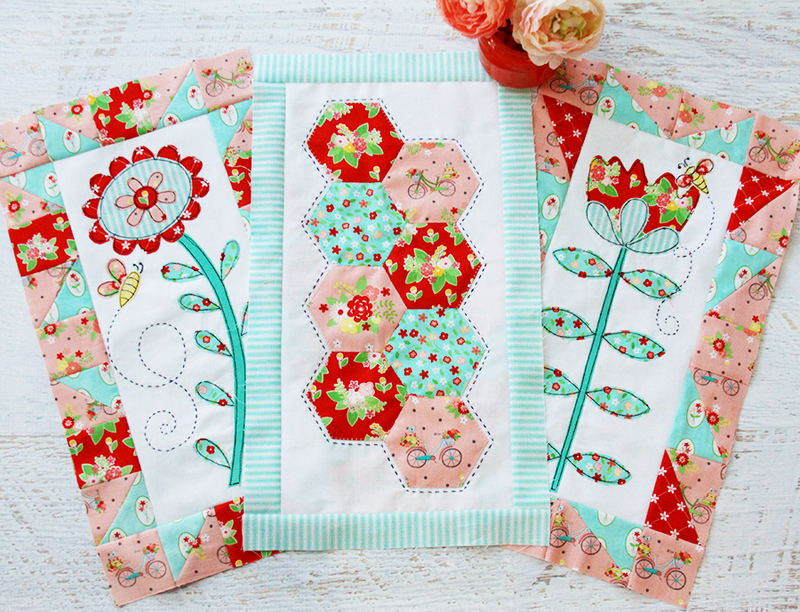 Love the colors & fabrics you used in your Save The Bees blocks. Undecided on Christmas projects. Illness in the family has caused me to be behind on my BOM’s. I will probably makes some Christmas stockings and ornaments with vintage bits and bobs. Love Christmas time. Actually, there are several projects that I’d like to make for the holiday season. I’ve a panel ready for borders to be along my hallway, a paper-pieced long tree for my front door, and a 60 x 60 wall hanging to go on the wall in my dining area. Aprons, aprons, aprons! I love making aprons and they make great gifts. Save the Bees is my first quilting project snd already loving it. I work on holiday items all year long. That is the only way I can get things done. This year I made a BOM in Christmas colors which won a blue ribbon. I hope to finish a Thanksgiving wall hanging for my kitchen. I’ve been meaning to finally replace our Tree Skirt. Right now I’m looking at patterns. Last year after Christmas,I bought the cutest “Christmas Material”. Of course if some “FUN” Christmas Material pops into my view, I’ll just have to snap it up!!! Holiday sewing??!!! of course I have some planned. First I will be making ornaments for many on my gift list. I think they will be hearts this year. I do not have any plans yet. But I’m sure there will be some shortly. Mug rugs and ornament coasters that didn’t get made last Christmas. When don’t we have projects planned right now I’m trying to get my daughter’s quilt finished before her wedding next month (95% done), I’ve got two Halloween projects to do for the grandchildren and of course for Christmas I have a christmas tree skirt and stockings for my grandchildren that I have to do. Some days it feels like there’s not enough hours but I love having multiple projects on the go. i always have holiday sewing planned. Now just to get some of it done. I’m not doing any Christmas projects this year. A family member will be needing my help for a short while. I will continue to work on my on going projects when I can. I would so love wining the Aurifil thread. I just love Aurifil threads. Working on holiday items 2 small BOM. Have not thought that far!! I on a mission to try Christmas gifts. Like pot holders, mug rugs or something. Planning on working on that during our quilt retreat in Texas at the end of the month. Good lick to me!!!! I’ve got a few things planned for holiday sewing. Zipper pouches for christmas, tree skirt and a christmas sew along all planned so far. No not at this time. Busy at work. I have table mats and small framed paper pieced gift items to quilt. I have several small gifts to quilt for gifts. I do not have a holiday sewing list at this time and have no ideas what to make for anyone. Currently I am surfing blogs looking for inspiration. There are certainly enough offerings to help. Thank you for the opportunity to win the lovely Aurifill thread. Yes! I always have holiday sewing! I am making a quilt for a co-worker and for my nephew! Yes, I always make family and friends something even if I buy them a gift….I feel it wouldn’t be Christmas without something homemade and made from the heart. I’ve started a couple of Christmas wallhangings and am making some crazy quilted stockings. I’m making a quilt for my Hubbie for his birthday which is on Christmas Eve. It’s a panel quilt with the pic of a stag out in the mountains. No holiday sewing. I gift quilts whenever I feel like it. But I love Christmas lights and Christmas decorations. I plan to finish one wall quilt and begin quilting a small hexie wall quilt! Lots of handwork, which I enjoy. I thought I might make Christmas stockings for the new Grand children. I just got my sewing room set up (almost!) after 3 years. I try to always have a baby quilt on-hand in case I need one. I have one almost finished and one of my nieces is pregnant! So that is the first project to work on. If I manage that, then I will make a bunch of mug rugs and coasters. Need to finish a baby quilt, then plan on a few small projects such as mug rugs. Really want to get started on a toddler bed quilt for our grandson. Right now the only holiday I’m working on is Halloween…one dinosaur and one Paw Patrol outfit. I’ve always got holiday projects planned. Now, will I get them done? That is a totally different question. My DIL asked me for a bed quilt so I’m currently working on that. However she just told me that she & my son are expecting their first baby next year, making me a first-time Grammy! Bet you can guess what I’d rather be working on now!!! Lol! Thanks for the chance to win some thread! Trying to make a Quillow for my Mom’s Christmas present that has cardinals and chickadees on the fabric. She loves to watch the birds eat the suet and seeds that she feeds them by her back deck. Very soothing and relaxing watching birds. Working on a few little items for co-workers. Yes, doing lots of holiday sewing….microwave bowls, little pouches, sweet little quilts for nieces, and some mug rugs. I love your fabrics and the dark stitching to highlight the hexies! I have my Christmas sewing all packed in the first tote to unpack when we get moved Nov.1. I have the foresight to get everything cut out and even got some piecing done. For each of my adult children and grandchildren’s households I have new tree skirts and sets of holiday placemats in their Christmas colors. I even managed to get 2 sets of placemats pieced before I had to pack the studio. I confess to suffering from fabric withdrawal! Yes! I have plans ( actually already started) on making lap quilts for our local assisted living home residents. I plan on making small EEP drink coasters for everyone at work. I am quilting a holiday theme quilt and planned to sew some pouches as gifts. I’m working on a challenge quilt with my group that uses the book, “Quiltmaker’s 1,ooo Blocks as reference. I’m using red, black, grey and white as the main colors. I have 4 UFO projects planned for my off time during holidays. My Grand daughters quilts! Planning on making mug rugs for my bookclub pals. I think your block is my favorite. I left you a comment for this giveaway, but I couldn’t find it. So I’m sure it’s at another post of yours, as I looked at plenty. I’m working on my Grand daughters quilts & some UFOs during my down time in the holidays, & on rainy days. Thanks for the chance! I have not even started thinking about the holidays yet! I prefer to make quilted items for every day and not often seasonal projects… unless something catches my eye and I simply have to make it! I love your fabrics! What a fabulous alternative. I am teaching a beginner class in November and I plan to use holiday prints to demonstrate a disappearing nine patch block for my students. OMG, yes, every family member is getting a handmade cross stitch christmas card. have been working on 38 cards since this past east. I love this BOM!!! All the designs are great!! My Christmas list includes making stockings for my grands and my fur babies. I also plan on making a fun small quilt for my three granddaughters, which includes some machine embroidery in a few blocks!! A lot to get done but I can do it!! Thanks for these awesome blocks!! I’m making some covered journals for family members this year. I made my 2 sisters each one last year and they liked them, so time to make some others…. No special holiday quilting planned. I don’t have actual sewing planned but I do plan to clean up my sewing spaces in hopes of being able to do some quilting! I have the pleasure of going to a quilting retreat in November which gives me time to do some sewing for Christmas – love it! Holiday sewing – Oh my YES! This year am planning on making placemats for everyone that comes to Thanksgiving dinner to take home with them and I am making special placemats for my Grandkids to use at their Christmas dinner this year! I love doing different special things each year for the kids. I am finishing up a Halloween Quilt now, but will soon pick up the 3 Christmas quilts I need for this year. Mostly the tops are finished, sort of, just need to quilt and bind and label. Here’s hoping! I have a Dresden plate Christmas top made with sparkly blue fabrics. I hope to finish it by Christmas. Holiday sewing? I just finished up a Christmas throw for one niece and am working on another for another niece! I have never sewn using a panel before, but I found the cutest one at my LQS that reads “Baby it’s cold outside” on a chalkboard-looking background and knew I had to make a quilt with it! Holiday sewing is always a fun treat. I’m working on a holiday mug rug. I’ve had an ongoing BOM Santa quilt that I’m trying to finish. I fell in love with applique and changed this Santa BOM from pieced to applique blocks. I’ve added different Santa’s in Action to make it more personal, e.g., Santa flying a plane, fishing, in a pickup truck and in a military uniform.. I just started testing quilting and I love it. This is gonna be my first christmas with my grandchild and I’m started a quilt for her and it’s so mutch fun. I’m planning a christmas runner or something like that after. I also planning doing a backdropp for my christmas village. I’m whising you al a great weekend . Does making a list count? I’m on the right track anyway!! I will be making a jewelry tote as a Christmas gift. M Y holiday quilting includes quilts for nieces and nephew, as well as quilts for the members of the family I adopt at Christmas time through my DILs work. I just finished machine quilting a Halloween and a Christmas quilt today, within another Christmas mystery quilt on the go. I am traveling until the 1st of December so not too much planned. A few simple things but just going to catch up on the other projects I have. I plan on making some Christmas wall hangings! I’m working on baby quilts, bibs, and burp rags for our local Babies In Need program. I try to sew every day – now that the grandkids are school age I have them help make an ornament for their tree – saw a cute quick ornament that will probably be the project this year! Yes, I have a lot of Christmas gifts planned out … now how many I get done is another question! No holiday sewing for me. My quilting this holiday weekend will be all about piecing my Judy Neimeyer pattern for my son for Christmas. Making progress, but it is slow!! I’D LIKE TO MAKE SOME EMBROIDERED ORNAMENTS, SOME DOLL CLOTHES FOR MY KIDS, AND A TREE SKIRT. I have a table topper that I made, but never quilted, so for this Christmas I will finish quilting it. I am in the midst of a felt Advent Calendar for my daughter and her fiance that is never going to be ready for this Christmas, but there is always next year. I love the fabrics that you are using for this quilt along. I am knitting socks for some of the gifts this year and crocheting angels for the Grands. I have no pressure quilting to keep me happy! I have a embroidered christmas stocking wall hanging from Crabapple hill and an embroidered pillow cover from Shabby Fabrics i’m working on.